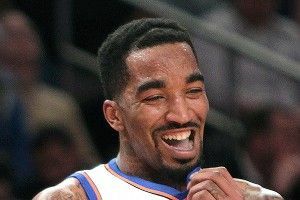 Earl “J.R.” Smith III and that hair situation. Does he realize what he looks like? Does he even know that there’s a part in his hair? Why did he let a barber ford his Afro and let the oxen die atop his head? I, for one, expected the unjust backlash to result in a hairstyle change by J.R.’s second game with New York. Thankfully, I was wrong. He was proudly sporting the same ‘do Monday night against the New Jersey Nets. Upon seeing this, it became clear that this was no accident, no botched last-minute haircut, no failure to look in the mirror — this was simply J.R. Smith, on the heels of Fashion Week, in the middle of Black History Month, and during his first week as a New Yorker, making a statement. I love and respect individuality, but my only words of caution for J.R. moving forward is that he might be attempting to make too many statements at once. It might just be too much for the public to handle. I say this, because if you thought it was a simple haircut, you were sadly mistaken. In J.R.’s world, it’s so much deeper. While Amar’e Stoudemire has been embraced by the fashion community in New York, be it sitting next to Anna Wintour during Fashion Week or making Rec Specs moderately cool again, J.R. has been trapped in Denver and China. He’s been itching for a stage like New York to really show his full fashion potential and, outside of tattoos, this Papa Fro-Baby Fro is just the way to do it. I think. On paper, J.R. Smith and Zooey Deschanel are pretty similar, but up until a few days ago, the main difference between the two was that Zooey had bangs and J.R. didn’t. Thankfully, with J.R.’s new look, that is no longer true. Now they are exactly the same. I know it’s challenging to consider that forehead soul patch thing as a member of the bang family, but if you look at photos of Zooey, it’s often 90 percent of her hair, some sort of line (be it a part or a flowery, lacy, adorable headband), and then this new situation that protrudes out of the front of her head. That’s the exact way to describe J.R. Smith’s new hair. He’s got bangs, people. Don’t shun him. Celebrate him. I think. Do you really think J.R. Smith hasn’t seen Juice? What about J.R. Smith’s whole being screams, “I haven’t seen Juice”? Do you actually believe J.R. Smith isn’t fully aware of the exact location of Makaveli’s part? Out of respect for the great black men who have rocked such iconic parts in the past (Frederick Douglass — usually back left; Booker T. Washington — side left; MC Hammer — racing stripes), J.R. is following suit, by carving out his own legacy with the rarely seen front part. Don’t be surprised, though, if that thing is gone by March 1. I think.